Here, will cover the main aspects of Magento’s request flow. 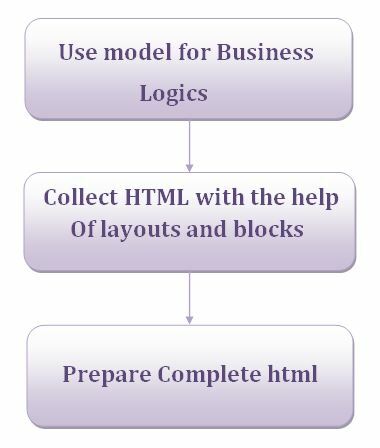 Bootstrap provides complete environment for execution of Magento application . echo 'Magento supports PHP 5.5.0 or later. ' . As clearly visible, function version_compare checks for php version. If version found is less than 5.5.0 then it is going to throw error message and stop further execution. line 16 : includes vendor file located at app/etc/vendor_path.php which in turn returns ‘vendor’. Populate autoloader will create two arrays for “Psr4” i.e prefixLengthsPsr4 and prefixDirsPsr4 as shown below . So how the Populate autoloader is finally set in action? for example, if Magento requires instance of “Magento\Framework\Autoload\AutoloaderRegistry“, initially it is going to take first letter of the class Magento\Framework\Autoload\AutoloaderRegistry. The first letter is ‘M’ so it will check if prefixLengthsPsr4[‘M’] is set, in case it is not found, it will throw exception and terminate execution. Here as it’s already set then it is going to search through each entry. NOTE : Don’t mind the directory separator if working in WAMP environment. “C:\xampp\htdocs\dev\m2\vendor/monolog/monolog/src/Monolog”, if not found it will continue searching in the next key. 2. similarly in prefixDirsPsr4[Magento\Setup\], if is not found searches in next key. if file is found in the above directory, same is returned i.e. As clear from its name that this function is initializing object manager and setting its instance to bootstrap variable “objectManager” for future use. Here $configFile is set to null, hence from the else condition i.e $this->file=”config.php” it will include /app/etc/config.php in line no- 79. Create function of object (Magento\Framework\ObjectManager\ObjectManager) will intialize HTTP App object which in turn will return instance of ‘Magento\Framework\App\Http’ . Now run($app) function of bootstrap instance will be called. Line 241 : initErrorHandler() initializes error Handler. Line 242 : initObjectManager() initializes object manager if it’s not initialized. Line 243 : assertMaintenance() inspects maintenance flag status. If set ‘yes’, maintenance page will display at forntend. Line 244 : assertInstalled() check if installation is completed, if not then will throw exception and exception handler will redirect it to setup directory. configuration is loaded according to area and by calling configure function, this merges all loaded configuration. Dispatch function of interceptor will be called, which in turn calls dispatch function of main front controller i.e. 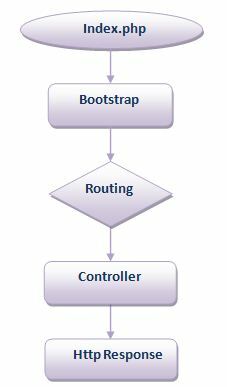 Magento\Framework\App\FrontController, further dispatch function of FrontController will call processRequest() for Routing. Routing has an algorithm to find a matching controller, determined by request. line 106 : is looping routerList and extracting the required one. Above config is adding two routers (standard and default) in routerList. It can check Line number 20 and 25. In both, disable parameter is set to false means both are active. Similarly you can use same method in your custom module for creating your own router. It is looping through each router and calling match function for every router. Match function will search for module’s frontend name, controller and action. Lets take router “Magento\Framework\App\Router\Base” so line 108 will call match function of Magento\Framework\App\Router\Base. Then match function will further call matchAction of same instance. 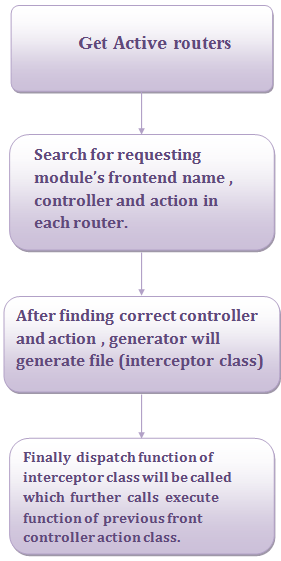 If match is found then it will call create function of factory which will create interceptor class file of found controller and then return instance of it. Dispatch function of interceptor will call main controller’s dispatch function and finally execute function of controller will be called. this function is responsible for adding default handlers as well as handlers defined by current controller. after that it loads layout configuration of all handlers added in previous step. prepares collection of all blocks associated with handlers. it renders all handler’s layout added previously and generate html output and appends it to a output variable. This is the end phase of magento execution where prepared output will be finally sent to requesting agent as HTTP response. Line 116 : $this->getContent() finally echo/print/output the content prepared by roaming inside magento application . If any issues / suggestion , comments are most appreciated . Next in the journey will create Products Featured Slider module in magento 2 .